CEDAR CITY – An Idaho man who led police on a pursuit Tuesday morning was taken to the hospital for stitches after police forced him to the ground for trying to take an officer’s gun. Chad Don Ramsey, 44, is facing a first-degree felony for attempting to disarm a police officer and a third-degree felony for failing to stop on command. Ramsey was also arrested for several misdemeanors including resisting arrest, theft, criminal trespass, open container in vehicle and possession of a controlled substance. The man who is listed as homeless on the police report is from Idaho. Police said he was traveling to California when officers arrested him and booked him into the Iron County Correctional Facility on $20,000 bail. 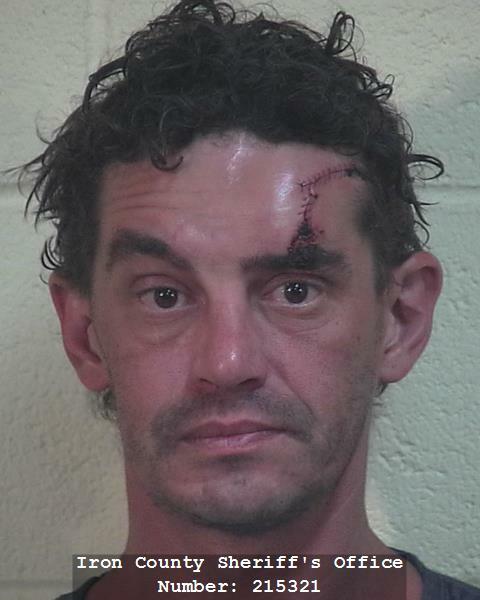 According to the charging documents filed in 5th District Court in support of the arrest, deputies were dispatched on reports of a fuel theft near 2300 W. Gap Road in Parowan Valley. The vehicle reported to be involved in the alleged incident was a gold Toyota Four Runner with Oregon license plates that were later found to belong to the previous owner of the vehicle. After trying to get Ramsey to pull over deputies initiated a pursuit around milepost 76 that finally came to an end in the northbound lane at milepost 58 after officers performed a PIT maneuver, which sent the vehicle into a spin. “Because Chad refused to stop on my initial traffic stop, during my verbal commands over the vehicle PA system, after driving over tire deflation device and then changing directions and forcing us to a PIT maneuver, I am charging him with fleeing (from an officer,)” the arresting officer, Iron County Sheriff’s Deputy Shawn Peterson, wrote in his report. Officers conducted a felony stop with guns drawn, taking Ramsey out of the vehicle. The suspect, however, refused to comply with law enforcement’s commands. At one point, Ramsey grabbed the barrel of a rifle belonging to Parowan Police Chief Ken Carpenter, according to the charging documents. The situation escalated as officers forced Ramsey to the ground to eliminate the threat of having him grab the weapon again, Iron County Sheriff Lt. Del Schlosser said. Ramsey suffered a laceration on his forehead that resulted from the incident. He was later taken to Cedar City Hospital for stitches and treatment of minor injuries. Ramsey refused to identify himself to officers continuing to tell them his name was “Chuck.” He eventually told medical staff his first name, Peterson said. Consider yourself lucky not getting a bullet. You do stupid stuff you’re gonna get hurt. Any other country might have let you bleed out…God Bless America. Don’t steal! It’s in the 10 commandments. If you stop stealing and stop smoking that dope and got a job- you’d feel better about yourself.